Marsupials are a unique group of pouch-bearing mammals that include well known animals such as kangaroos, wallabies, koalas, opossums, wombats, Tasmanian devil, as well as many lesser known species such as bandicoots, bettongs, the bilby, quolls, numbat, and the quokka. 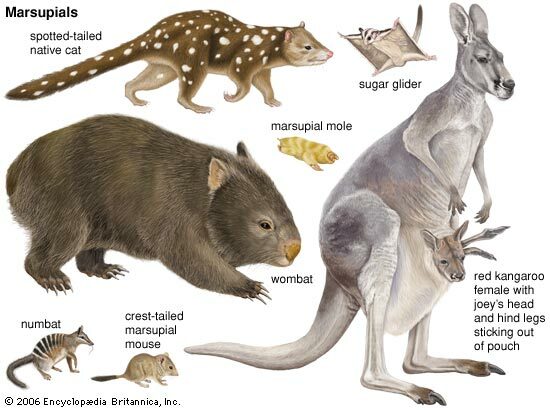 About 70% of the 334 extant species of marsupials live in Australia, New Guinea, and nearby islands, with the rest occurring in South and Central America (except for one in N. America - the opossum). The only endemic placental mammals in Australia are a few species of bats and small rodents. All of the nearly 200 marsupial species in Australia and nearby areas are native only to Australia, and according to both genetic and fossil evidence, are evidently are a monophylitic group--that is, evolved from the same ancestral stock. Moreover, all five living species of monotremes (egg laying mammals such as the echidna and platypus) occur in the same geographic area. This unique situation can be attributed to the continent's geographic isolation for over 30 million years, and it's unique climate. These conclusions are supported by extensive geologic, paleontologic, and genetic evidence (Kelsey and Mitchel). In contrast, the Young Earth Creationist (YEC)/Flood Geology position, which holds that only a pair (or at most 7 pairs) of each Genesis "kind" debarked the Ark in the region of Turkey after a violent global Flood just a few thousand years ago, has a serious problem explaining these animal distribution patterns. 1. After the Ark landed, why were almost all the animals that ended up in Australia marsupials and monotremes? 2. If scores of marsupials could somehow make the journey, why did virtually no placental do the same? 3. How did animals such as koalas that are slow moving and depend on very specific foodstuffs and environments that would have been sorely lacking after the Flood even survive the required long journey, especially with a major ocean barrier? 4. How did animals like the flightless kiwi, the blind marsupial mole (which lives only in sand), or the sugar glider (a gliding marsupial superficially resembling flying squirrels, which lives in trees) make the incredible trip? The few YEC attempts to address this problem have been weak and implausible. Some YECs such as Paul F. Taylor (2007) suggest that perhaps a large land bridge from Asia to Australia existed after the Flood --ignoring geologic evidence that no such recent bridge existed (with the most recent connection to other continents being over 40 million years earlier), and that even if it did, it would not explain why virtually no placental animals used it. Taylor also suggests that many animals may have drifted to Australia on floating logs, but doesn't adress how they survived the long log-ride without fresh water or sufficient food, and again fails to deal with the dominance of marsupials, never explaining why placental animals would have missed the floatillas. Yet other YECs propose incredibly rapid continental drift, which likewise neglects the issue of marsupial to placental disparity, contradicts extensive geologic evidence, and violates principles of physics. Interesting, Taylor makes the comment that "It is not a problem for us to rationalize why certain animals do not appear in certain parts of the world." Yes, YECs can "rationalize" the problem away, but have not resolved it in any way consistent with the vast bulk of scientific evidence. Other YECs have suggested that many marsupials did migrate to many other areas of the earth as well, but did not survive in most of them. They suggest the lack of fossil evidence for this is due to the incomplete nature of the fossil record. However, this not only conflicts with the frequent YEC assertion that evolutionists should not use the incompleteness of the fossil record to explain any "gaps," and becomes untenable when one considers the great number of marsupial taxa that are endemic only to Australia, both as living and fossil forms. Perhaps realizing the immensity of these problems for the YEC position, some have appealed to ad-hoc, extra Biblical miracles. For example, a YEC author going by "KC" proposed that perhaps the Australian marsupials didn't migrate to Australia, but were "placed" their by God (Stear, 2010). This reminds me of the similar conclusions that the ICR "RATE" project came to on the problem of radiometric dating evidence. The authors could not give any plausible scientific explanation for the massive amount of radioactive decay evidenced in the geologic record. Rather than face the logical conclusion that the earth is indeed many millions of years old, they evoked a miracle to vastly accelerate nuclear decay rates, and then realizing that this would create enough heat to melt the earth, evoked more unspecified miracles to protect the earth and all life on it from the immense heat. The authors never offered an explanation as to why God would cause such an acceleration in the first place (whose main effects would be to make the earth look old and generate lethal heat). With this approach, one can evade virtually any scientific problem, but it seems to severely undermine the "science" of "scientific creationism." Another problem for YECs is that many Australian marsupials resemble and behave similarly to various placental animals with similar ecological niches, but are physiologically very distinct. Mainstream scientists attribute this to the priciple of convergent evolution during a long period of geographic isolation (Johnson, n.d). In a YEC framework, the existence of parallel placental and marsupial forms seems difficult to explain. This brings up one of the most imaginative but misguided proposals to deal with these problems for YECs, made by Robert Byers (2005). Byers suggests that perhaps each of the marsupial species and their placental counterparts belonged to the same "Genesis kinds", with existing genetic variation allowing placental animals to rapidly change (through so-called "microevolution") into marsupial forms after arriving in Australia. However, the similarities between certain placental and marsupial animals are only superficial. Anatomically and physiologically they are very different types of animals, and no microevolution explanation works to explain their distribution, or even comes close. Physiologically any such changes would clearly be examples of macroevolution, and ironically, require more dramatic and rapid evolution than even conventional science allows. In fact, attempts to explain how and why mostly marsupials migrated to Australia after the Flood is largely mood in view of all the scientific evidence that there was no recent global Flood, and that the earth is over 4.6 billion years old. Ironically, some of the oldest dated rocks on earth (dated at about 4.4 billion years) are found in Australia (Landau, 2014), along with fossils of some of the earliest fossil life forms (Pennisi, 2011). The unique assemblage of fauna in Australia and nearby areas is consistent with evolutionary and geologic evidence, but presents major problems for YEC/Flood Geology models. Taylor, Paul F. 2007. Chapter 11, "How Did Animals Spread All Over from Where the Ark Landed?" in: The New Answers Book, Ken Ham, editor. 2007, Master Books. Web version of chapter at: https://answersingenesis.org/animal-behavior/migration/how-did-animals-spread-from-where-ark-landed/ Note: The web version gives the author as Paul S. Taylor, but the book indicates Paul F. Taylor.